NUWFC end the season with a win and Celebrate in style. 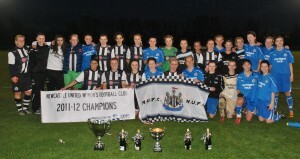 We’re proud to support the ladies of Newcastle United Women’s Football Club, who’ve just been crowned Championship Winners for the 2011/12 season! They receive very little financial support and are always keen to hear from sponsors so if you or someone you know would like to donate or help provide them with a new kit for next season, get in touch!